With considerable uncertainty and obvious tentativeness, news outlets 20 years ago struggled to describe the then-new phenomenon of the World Wide Web. Their tentativeness seems quaint nowadays, and a bit droll. 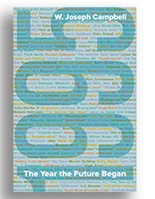 But as I point out in my new book, 1995: The Year the Future Began, it wasn’t as if the experiments in locution about the early Web were necessarily wrong. They were, though, strikingly cautious and uncertain at a time when the Web was entering mainstream consciousness. Revisiting these descriptions is not meant to ridicule the efforts to define the lexicon of the early Web. Rather, looking back offers reminders about how embryonic and shifting the Web vernacular was in 1995. As Lauren Kirchner noted a few years ago in Columbia Journalism Review, the Internet of the mid-1990s “was so wide open and undefined that the right language didn’t even exist to talk about it yet.” Terms such as “internaut” — a blend of Internet and astronaut coined to describe a frequent Internet user — circulated for a while without really catching on. It’s important to note, too, that even in early 1995 some journalists were notably perceptive in describing the Web and what it would become. “As with all truly great communications tools, including the printing press, the television, the telephone and the personal computer, the Internet’s World Wide Web is both a dynamic information source and a prodigious productivity waster. Familiarity with, and understanding of, the workings of the Web seemed to deepen over the course of 1995. By year’s end, news organizations appeared to be more confident — and certainly more lavish — in their characterizations. More tamely, the American Dialect Society designated “World Wide Web” as one of its two “words of the year” of 1995. “Newt,” as in Newt Gingrich, the voluble speaker of the House who came to power in 1995 and was Time magazine’s “man of the year.” Newt also was a principal force in bringing about two partial shutdowns of the federal government in 1995. This entry was posted on January 18, 2015 by W. Joseph Campbell in Anniversaries, Early Web, Internet, Technology, World Wide Web and tagged 1995, Cool, Early Web, Internet, New York Times, Newt Gingrich, Watershed year, Web vernacular.